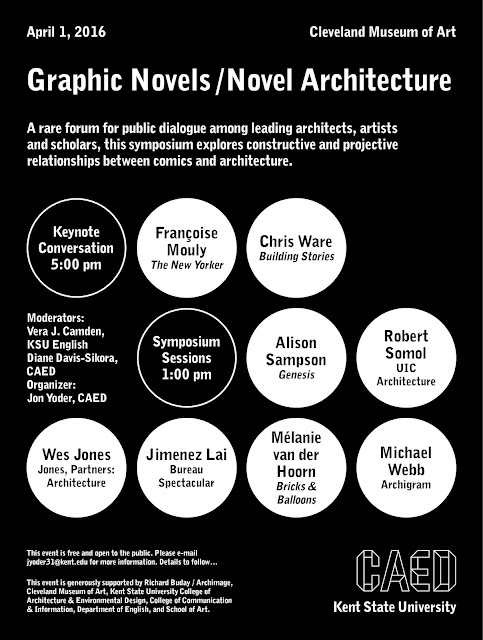 A provocative forum for conversation among leading architects, scholars and artists, the Graphic Novels / Novel Architecture symposium will examine the burgeoning influence of different types of graphic narrative—including animations, cartoons, comics, illustrations and storyboards—on contemporary architectural design. Participants will include Vera Camden, Diane Davis-Sikora, Wes Jones, Jimenez Lai, Françoise Mouly, Alison Sampson, Robert Somol, Mélanie van der Hoorn, Chris Ware, Michael Webb and Jon Yoder. The symposium is free and open to the public, but reservations are recommended.